I know I’m not the only one who has agonised over this. The standard advice is to find your local yarn store or Spinners and Weavers Guild or go to a craft fair and try a few out. Try out as many as you can before you invest in anything. And this is very sensible advice, but there are two good reasons it may not apply. For one, many of us don’t have a local shop, aren’t near any guilds, or can’t get to the craft fair etc. This is a frustrating obstacle, and often leads to potentially good spinning time being wasted by procrastination – shock, horror! For another, if you haven’t spun before, how on earth are you going to know if you like a particular wheel or not? And given how frustrating the first few attempts are, this may not be something you want to have to do in front of a bunch of onlookers at a fair. Also consider how different the first few hundred metres of yarn you spin is, compared to what you will spin later when you’ve got the hang of it. Things like posture, treadling speed, drafting speed and yarn gauge will all change dramatically after you’ve spent a good few hours getting the feel of the process. So I’m going to play devil’s advocate and say that it’s ok to skip the trying-out process if you really want to. An alternative and equally sensible approach is to find an old cheapy somewhere and learn first before you go looking for the love of your life, I mean, your real wheel. Read lots of reviews and do research by all means, but generally the wheels that most often come up for sale cheaply are the old faithfuls of the spinning world, which mostly make reasonable beginner wheels. Here in Australia it’s mostly Ashfords. Try the local paper if there’s no local guild, or ebay or whatever other online trading/sales systems happen to be running in your area, but if possible buy from a spinner, because they will probably want their old wheel to go to a good home where it will be used and not stuck in a corner as a dust collector. They have used this wheel and are familiar with its quirks, so ask them to tell you as much as they can about it. Is the tension finnicky? Does it need oiling often to run well? Hopefully they will also tell you to peddle slowly and keep trying, and to start with something nice and easy like some roving rather than a lump of unprocessed fibre, so that your early experiences have as few extra frustrations as possible! Beware though, learning to spin is not necessarily enjoyable at first. (Conversly, once you get the hang of it, it’s dangerously addictive!) You can read about my abysmal first attempts and helpful hints here. Having someone show you the ropes certainly helps clear up some of the confusion, but failing this, between Youtube and your local library, and with either a good bit of persistence or an indomitable sense of humour, you’ll be spinning in no time. Well, maybe 6 hours or so.. Entry filed under: Spinning and Knitting. 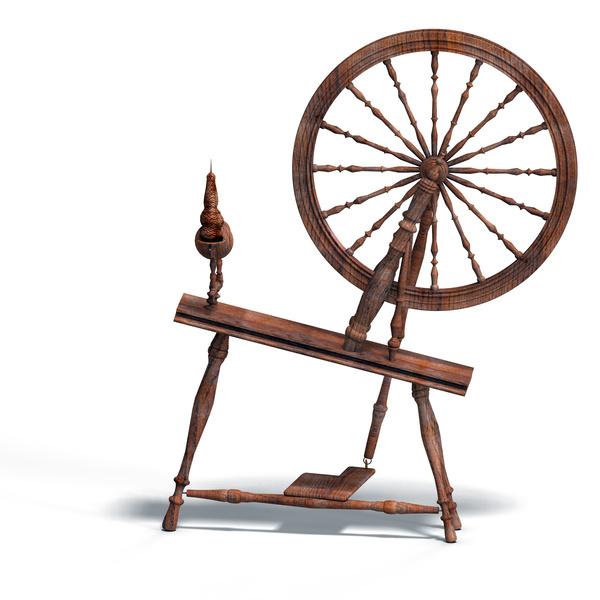 Tags: Choosing a spinning wheel, first spinning wheel, Spinning, spinning wheels, wheels. Interview: Naomi Parkhurst, Gannet Designs. Shawl of Many Shapes, a fundraiser. Care instructions for lace shawl gifts.